In the second part of my blog for PET DENTAL HEALTH MONTH I will discuss some options for looking after your pet’s teeth at home. 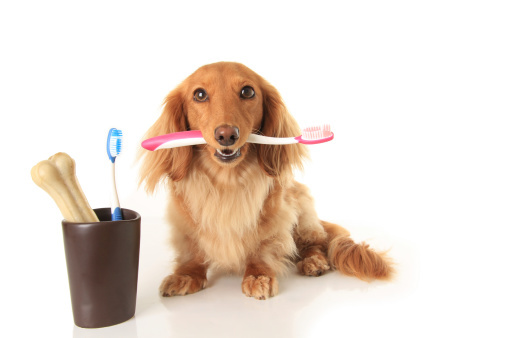 BRUSHING YOUR PETS TEETH – Like humans the VERY BEST option is daily brushing. Plaque forms when the food film on the tooth is mixed with bacteria, and the when teeth are brushed the brushing motion removes most of the plaque. When plaque is not removed, in a few days it turns into hard tartar. And once tartar is formed, only dental instruments can remove it properly. However, if your pet already has moderate to severe dental disease, you should talk to your veterinarian before you start to brush their teeth because it could be painful for them to have their gums brushed. If your pet’s teeth are in great shape, or if they have just had a professional dental cleaning done, it is the perfect time to start brushing their teeth. A soft-bristle toothbrush (human toothbrush is fine) or a finger brush should be used. You should use a pet toothpaste because pets don’t know how to spit out the toothpaste and human toothpaste can cause GI upset. Pet toothpaste is usually flavoured with chicken, beef, or fish flavours. Make this fun for your pet. If you have never brushed your pet’s teeth, start by putting a small amount of toothpaste on your finger, and rub that on their gums daily. After they get used to this daily ‘treat’, switch to the toothbrush and start brushing their teeth. Hold the brush at a 45 degree angle and brush from the gums to the tip, or in a circular motion. It’s important to brush underneath the gums as well. The tongue side of the teeth are less important to brush. Go all around the mouth and all the way to the back of the mouth. Even though some toothpastes are designed to help enhance the effectiveness of brushing, remember that the actual brushing is the most important aspect of removing plaque from a tooth. DENTAL DIET: We recommend Prescription Diet T/D for dogs and cats. The T/D kibble fibres are arranged so that when pets chew on the kibbles, the plaque on the teeth that chew is reduced. This is particularly helpful for some cats that do not tolerate teeth brushing at all. Again, keep brushing their teeth! WATER ADDITIVES: There are a number of water additives on the market that claim to be beneficial for pets’ dental health. We recommend Healthy Mouth water additive which is the ONLY water additive that bears the VOHC (Veterinary Oral Health Council) seal. This product is not sold in pet stores. It’s best to use this combined with daily teeth brushing, however you can still use it even if you absolutely cannot brush your pet’s teeth. CHEWS, ORAL RINSES AND GELS: Ask one of our team members whether any of these would be beneficial for your pet. There are a growing number of these products on the market, some of which are beneficial while others simply do not do much…….but there are some different options you can consider. WHAT SHOULD I NOT DO? Do NOT give to your pet Natural bones (eg. beef/pork bones), antlers and some of the hard plastic toys. These are simply too hard for your pet’s teeth. We have seen numerous tooth fractures in dogs that have chewed on these products. Broken teeth need to be either extracted or have root canal therapy done. A rule of thumb is that, if something is too hard to bend with your fingers, it’s too hard for your pet to chew on. I hope this has been helpful. Please call us if you would like more information or better still bring your pet in for us to evaluate his teeth. At every annual exam we evaluate your pets teeth and make a recommendation for home care and/or professional dental care. My next and final Dental blog will discuss Professional Dental Cleaning and what is involved and why we often recommend it!